Catherine Carey, Lady Knollys was the daughter of Mary Boleyn and William Carey. When Catherine’s cousin Queen Mary came to the throne they fled the country for fear they would be persecuted for their Protestant beliefs. 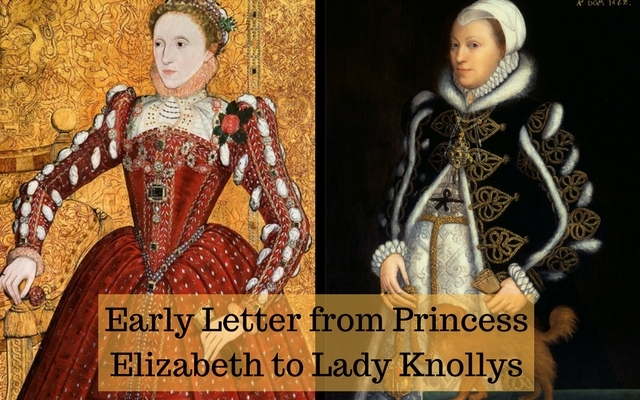 This letter was written in 1553 making Elizabeth twenty years old. Elizabeth and Catherine always had a close relationship – is it possible because Elizabeth had a feeling they were sisters instead of cousins? We’ll never know for certain. Catherine came back to England in 1558 and served Queen Elizabeth as Chief Lady of the Bedchamber until her death in 1569.
Letters of royal and illustrious ladies of Great Britain, from the commencement of the twelfth century to the close of the reign of Queen Mary; by [Green], Mary Anne Everett (Wood), Mrs., 1818-1895, [from old catalog] ed Publication date 1846 Publisher London, H. Colburn. Pages 279-280. The tinder sentiment seems real enough…I am delighted to see my 12th great grandmohter’s correspondence with the future Queen. The fact that she did come back and serve her queen as she did makes me believe she understood her to be her 1/2 sister. Her Daughter’s child with Lord Robert Dudley 1533 must have a terribly distressing time, but since the boy Essex was also a lady in waiting’s son to the Queen by her prime love interest the relationship would have more connection than a cousins child. I read recently that the ring she gave to ESSEX should he ever need her help was not delivered to Elizabeth when he sent it…for which the Queen supposedly told the woman “I can never forgive you” in failing to notify her of his peril…. IF they were sisters they would be 1/2. Not sure where you get 3/4 from.